The World Tourism Day celebrated on September 27 is aimed at fostering awareness among the international community of the importance of tourism and its social, cultural, political and economic value. Over the past half century, tourism has become one of the fastest growing economic sectors in the world. For some countries, tourism is even the main source of revenue for the state budget. The United Nations General Assembly declared 2017 as the International Year of Sustainable Tourism for Development recalling the potential of tourism to advance the universal 2030 Agenda for Sustainable Development and the 17 Sustainable Development Goals (SDGs). The International Year aims to support a change in policies, business practices and consumer behavior towards a more sustainable tourism sector than can contribute effectively to the SDGs. The Day is celebrated in most countries of the world for more than 30 years, including in Azerbaijan. In Baku, Azerbaijan a festival dedicated to the World Tourism Day was held at the Maiden Tower and the Historical and Architectural Reserve of Icherisheher (Old City), Trend Life reported. 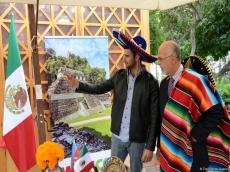 Embassies of more than ten countries, including Turkey, Iran, Uzbekistan, Hungary, Poland, India, Mexico, Russia, South Korea and Greece presented their national pavilions at the fest. National souvenirs, booklets, books about history of the participating countries were presented at the event.